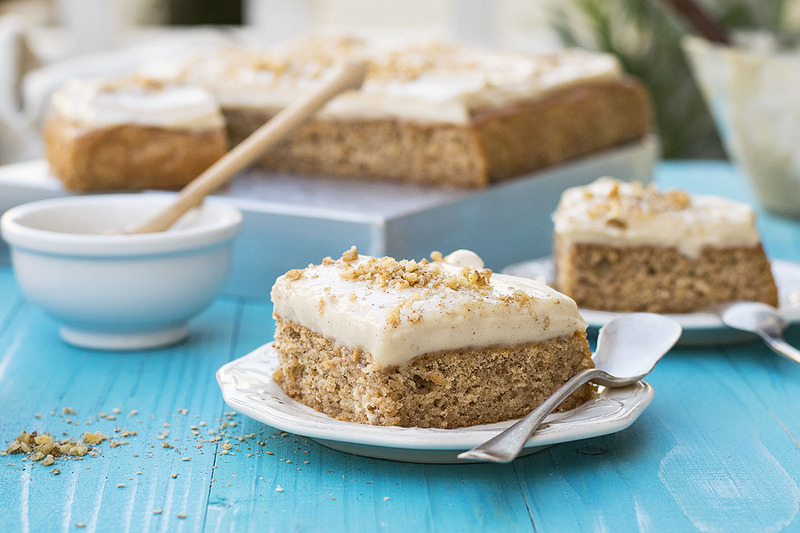 This walnut sheet cake is a very fluffy and moist, popular Greek dessert. It’s usually served with a vanilla custard cream on top. 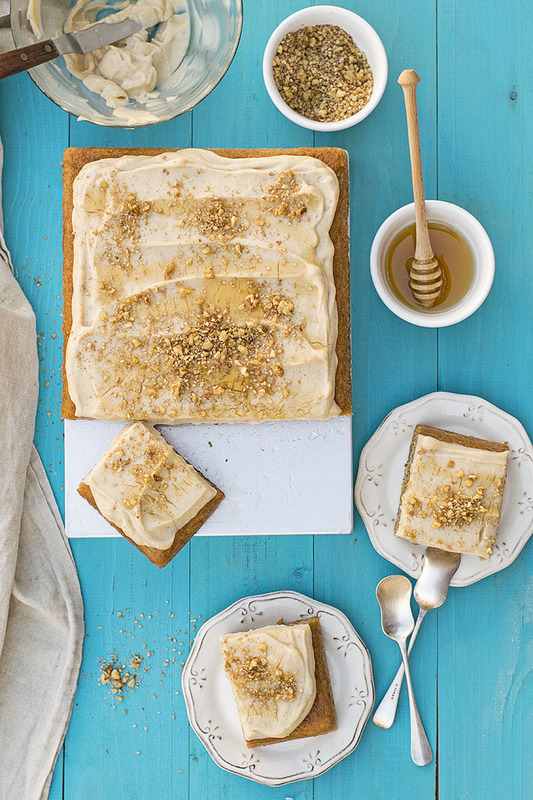 This Greek walnut sheet cake is one of my favorite desserts. Karidopita comes from the words “karydi” which means walnut and “pita” which means cake. It is so light, airy and fluffy that you can actually eat 3-4 large pieces without even realizing it. True story, it has happened to me! The base, which is just like a sponge cake but with the addition of ground or chopped walnuts, is soaked with a rich, scented simple syrup and then covered by a smooth and velvety vanilla custard cream. The end result is so tender and creamy, that this dessert is usually eaten with dessert spoons, just like a pudding. There are many types of walnut cakes (karidopita) in Greece. Some are made the same way as an everyday cake (you beat some butter or oil with sugar, then add the eggs and some liquids, and at the end add the flour and the walnuts) while others are made like a sponge cake (or pan di Spagna) with the addition of crushed walnuts. The common thing is the syrup which makes it extra moist and delicious! For this recipe, I chose to make the sponge cake version because it gives an extra fluffy, light and tender result. About the syrup. Some people like their karidopita with the syrup dripping from every little pore. If you like it this way too, you can increase the quantities for the syrup by half. It won’t get mushy because pan di Spagna has the ability to hold syrup very well without compromising its texture. However, because it is so tender and fluffy I find that the suggested quantity is enough. About the vanilla custard cream. It is best to weigh the ingredients for the custard since if you use extra cornstarch it can make it a bit dense. 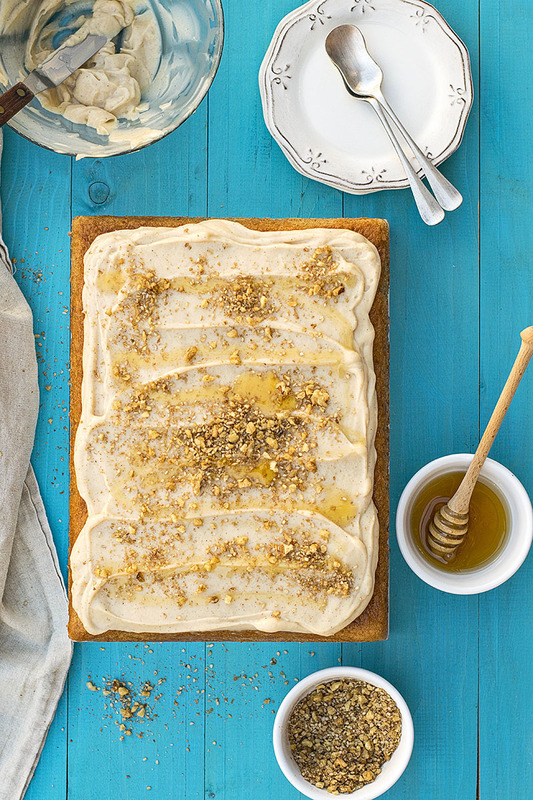 Not that it won’t taste good, it just may lose that velvety, smooth, and light texture which will bring this walnut sheet cake to another level. 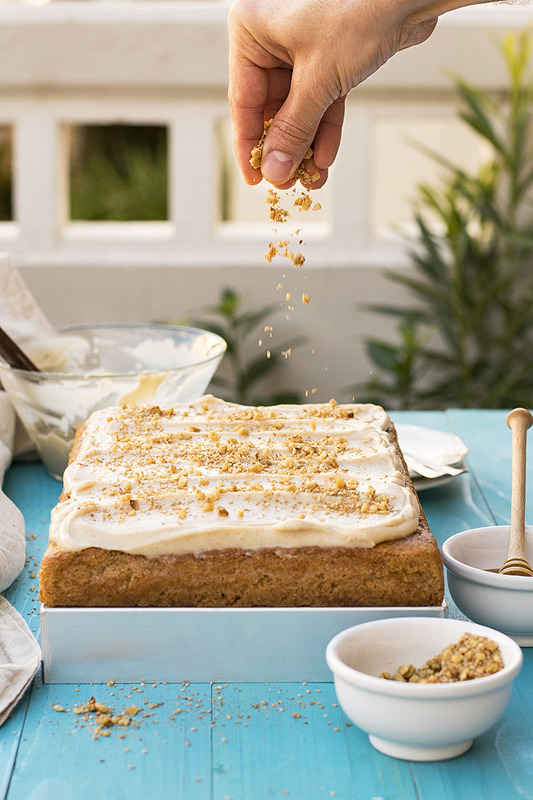 The crushed nuts and the honey on top are optional, but they look extra nice! Warm the eggs in a bowl with very warm water. Warm eggs will beat faster and will need less time to increase in volume. For complete success, you should beat the eggs VERY well until they reach the consistency of thick shaving foam. You can use finely ground, or coarsely chopped walnuts, depending on the texture you wish to achieve. I like them finely ground. Syrup: You can increase the quantities for the water and sugar by 1/4 of a cup (or more!) if you want your walnut sheet cake extra moist, or decrease them by 1/4 of a cup if you want it less sweet. 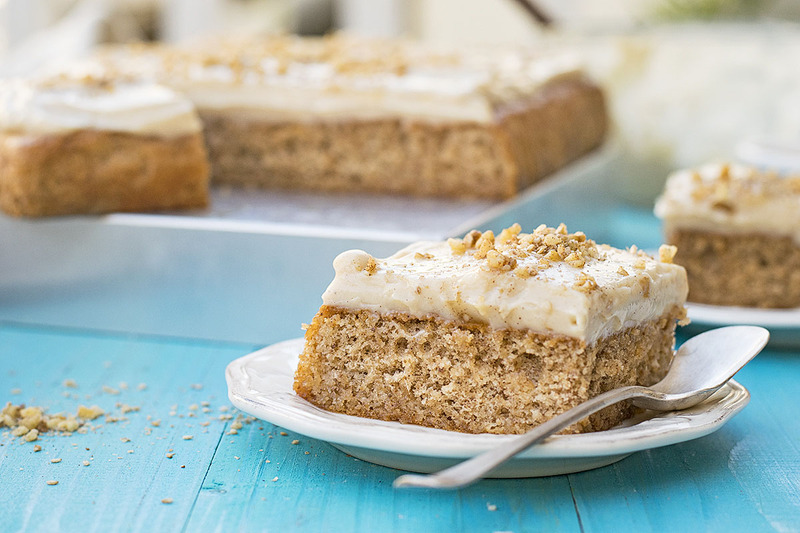 Though the custard cream pairs very well with this walnut cake, if you want to save yourself some time, you can skip it and just cover the cake with lightly sweetened whipped cream flavored with some vanilla. 1 1/2 to 2 cups cream should be enough. Substitute roasted almonds, hazelnuts, or pecans for a different flavor profile. 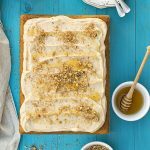 This walnut sheet cake is a very fluffy and moist, popular Greek dessert. It's usually served with a vanilla custard cream on top. Make the vanilla custard: transfer the sugar, the cinnamon, and the cornstarch to a medium pot and stir to mix. Add the eggs and beat to combine. Add the warm milk and the vanilla and whisk well. Heat over medium heat, whisking constantly until the mixture thickens. When you notice it is almost ready to bubble, remove from heat and transfer to a clean, heatproof bowl. Add the butter and mix well. Cover with cling film, making sure that the film touches the surface of the cream (this prevents the forming of a “skin” on the surface while the cream cools) and refrigerate until cold. Preheat your oven to 350°F (175°C) and lightly oil or line with baking paper your baking pan. Make the walnut cake: Transfer the eggs, the white sugar, the brown sugar, the vanilla, and the salt to the bowl of your electric mixer and beat until pale and fluffy. When done, the mixture should resemble thick shaving foam. In another bowl mix the flour with the cinnamon and the baking powder and sift them to aerate them. Add the flour mixture to the egg mixture gradually, folding with a spatula. Don’t over mix because the mixture will deflate. Add the walnuts and fold just until evenly incorporated. Pour the batter into the baking pan and bake for 30-35 minutes or until a toothpick inserted in the center comes out clean. Let it in the pan to cool. Make the syrup: transfer the water, sugar, and cinnamon stick to a small pot and bring to a boil. Boil for 2 minutes and take off the heat. When the syrup is no longer hot, add the honey and the brandy and stir well to combine. Poke some holes into the cake using a chopstick or a fork. Pour the syrup over the cake in small batches, waiting for the syrup to completely absorb, before pouring the next batch. Cover the walnut cake with the custard and store the cake in the refrigerator until ready to serve. 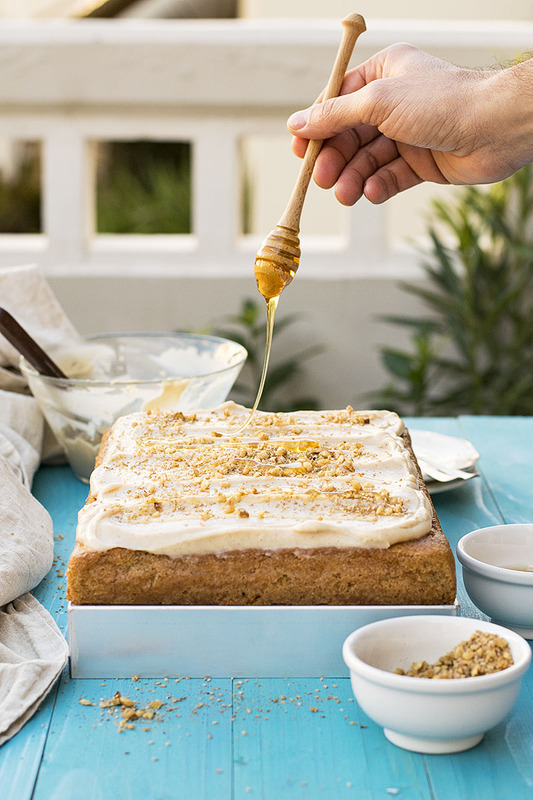 Just before serving, sprinkle the cake with a mixture of toasted chopped walnuts, toasted sesame seeds and a pinch of cinnamon and drizzle some thyme honey. Prep time don't include cooling times. You can increase or decrease the amounts of the water and sugar for the syrup by 1/4 of a cup depending on how sweet you want the cake to be. Yum, that syrup oozing out of the cake must make this a wonderful thing to eat. I really love Greek desserts that have custard in them. Thank you Fran, I’m very happy you like this! This looks absolutely delicious. I’d love to have a piece or 2 now :).